We’ll just say up front ~ these aren’t super inexpensive to make but they are worth every penny spent on the high-end ingredients that go in to them! And they’re soooo delicious! Nourishing, filling, and flavour-full!!! – these ‘Breakfast Bites’ are high protein, high fibre, full of healthy fats, and nutrient dense! A great little boost for everyone in the family as they head out the door. 2 Tablespoons Organic Coconut oil (the ‘white’ kind that’s solid at room temperature). Add first 9 ingredients to FOOD PROCESSOR pulsing and scraping down the sides as you go. Add the Pepitas and puffed Quinoa at the end and pulse until mixed. Wash hands thoroughly with Thieves® foaming hand soap (a kitchen staple) and using your hands roll the mixture into 1 inch balls — roll the balls in a dish of shredded coconut. MAKES APPROX. 2 DOZEN. Store in container in refrigerator for up to one month. Enjoy as ‘Breakfast Bites’ or any time! Re. Nutmeg Essential Oil & Thieves® Foaming Kitchen Soap: To order the finest essential oils of the utmost sourcing, science, and standards, from Young Living Essential Oils – world leader in essential oils – at 24% discount, all the time, CLICK HERE! Salad plates and bowls are a great way to take action this year, to increase your intake of fresh, whole, raw, organic, natural foods, and infuse a little extra antioxidant and immune boosting power into your daily diet. Humble ingredients, or more daring, a salad need not be lettuce at all if its not in season…and a dressing need never be boring from a bottle! Whether your salad base is cold roasted beets, sweet potato, asparagus, broccoli, red pepper, or cauliflower – boiled green beans or egg – spinach, kale or romaine – whether it has added lentils, rice, beans, cold pasta – sweet onion or the extra crunch of walnuts, hemp hearts, cashews, chia seeds, or pepitas – a touch of sweetness from berries, citrus, apple, or pomegranate seeds, or saltiness from goat cheese, tuna, or anchovies, most people agree that the salad “dressing” can make or break the final enjoyment of it! Many commercial salad dressings, though tantalizing to our taste buds, are actually made with unhealthy fats, sugars, and undesirable additives. Once you have the basic ingredients on hand, making your own dressing is quick, easy, healthy, and delicious! Use the following basic ‘recipes’ as a guide to make your own D.I.Y. versions. Taste and tweak as you go before drizzling them over your salad plate. Soon you’ll be whipping one up each time with your own favourite healthy ingredients. Since they are not heated, salad dressings, like breakfast smoothies, are a great way to add the antioxidant and immune boosting power found in a drop or two of genuine Young Living ‘Vitality™’ or ‘Plus™ +’ (food flavouring) essential oil (essential oils that are FDA (US) certified & NHP [Health Canada] approved). Keep unused vinaigrettes in a glass jar in refrigerator and use them until their gone! They’re also lovely drizzled over steamed veggies, rice, or cooked pasta. 1 Shallot or slice of Sweet onion finely chopped (optional) – NOTE: adding onion or shallot to the vinaigrette ahead of time lessens their pungency and pulls out their sweetness. 1 drop of a genuine Young Living ‘Vitality™’ or ‘Plus™ +’ (food flavouring) essential oil of your choice ~ (FDA (US) certified & NHP [Health Canada] approved). U.S. / Vitality™ oils from Young Living Essential Oils: Lemon, Lime, Orange, Tangerine, Citrus Fresh™, Clove, Ginger, Basil, Coriander, Fennel, Dill, Marjoram, Tarragon, Thyme, Black Pepper, Celery Seed or Sage. Canada / ‘Plus™ +’ (food flavouring) essential oil: Lemon, Lime, Orange, Basil, Black Pepper, or Oregano. A drop of Clove Vitality™ oil added to your dressing, for example, is lovely with beets. Lemon in a fruit salad. Ginger Vitality™ with green beans and cashews. Basil with spinach and chick peas. Coriander with roasted sweet potato and kale, Thyme or Tarragon Vitality™ with tomatoes and tuna. Black Pepper with eggs and romaine. Same as above adding 1 teaspoon to 1 Tablespoon Ningxia Red antioxidant juice. Here’s our bonus complete recipe and instructions for a Roasted Sweet Potato Quinoa Lentil Chicken Salad with Sesame Balsamic Vinaigrette. Try adding a drop of Black Pepper, Coriander , or Ginger Vitality™ essential oil to finish this vinaigrette!!! with joy over Creative Salading together with you! IMPORTANT: THE INFORMATION WITHIN THIS DOCUMENT WAS OBTAINED FROM REPUTABLE RESOURCES (linked), LECTURES, AND BIOCHEMISTRY EDUCATION WHICH THE AUTHOR HAS RECEIVED OVER THE PAST TWO DECADES. IT IS NOT INTENDED TO PRESCRIBE OR RECOMMEND A PARTICULAR TREATMENT OR PROTOCOL, BUT RATHER, TO EMPOWER THE READER WITH KNOWLEDGE THAT MIGHT HELP THEM TO HELP THEMSELVES TO BETTER HEALTH NATURALLY. 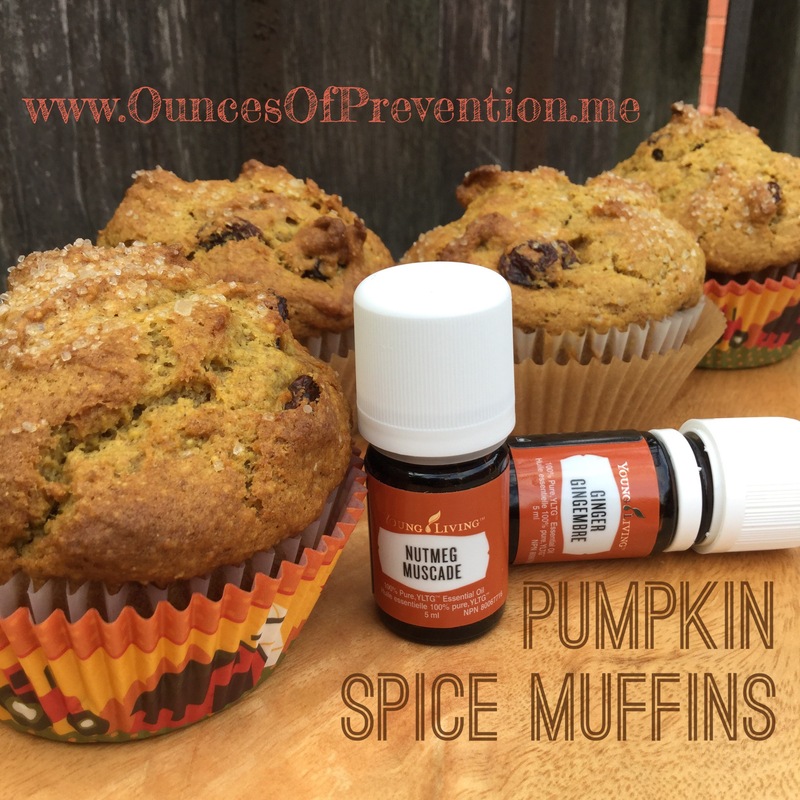 The taste of autumn, Thanksgiving, and Octoberfest, pumpkin spice muffins are perfect for entertaining, school lunches, or treating yourself along with a hot cup of your favourite tea. 1/2 cup organic coconut oil (it is solid just below room temperature, so melt some by placing near stove as it preheats, or by placing jar of coconut oil in a bowl of warm water for a few minutes until you can pour off 1/2 cup). 3 cups Spelt flour (light, or whole) OR Einkorn flour (the original non-hybridized wheat. See source link below for wholesale access to Gary’s True Grit Einkorn flour). Young Living Nutmeg essential oil – dip clean toothpick in top of essential oil bottle and swirl toothpick in batter. Young Living Ginger essential oil – dip clean toothpick in top of essential oil bottle and swirl toothpick in batter. Roasted no salt OR Raw Pepitas (shelled pumpkin seeds) for tops (optional). Beat eggs slightly. Add the 1 cup of Sucanat, the oils, and the pumpkin purée. Beat until well blended. Add dry ingredients, mixing until smooth. Stop and add the nutmeg and ginger essential oils by dipping a clean toothpick in top of essential oil bottles and swirling toothpick in batter (this uses less than a drop and provides enough flavour). Mix a few more seconds. Line muffin tins with paper liners, and fill 2/3 full with batter. Sprinkle tops with remaining Sucanat and pepitas (optional). Bake at 375 degrees F for 15 to 20 minutes, until wooden pick inserted in middle of a muffin comes out clean. Serve warm or cool and store in refrigerator for up to one week. ❤️ Spice up your Hot Honey Lemon! Add a drop of lemon and cinnamon, ginger, or cardamom, Young Living Therapeutic Grade essential oil, for a comforting beverage to soothe and boost immunity all at the same time! 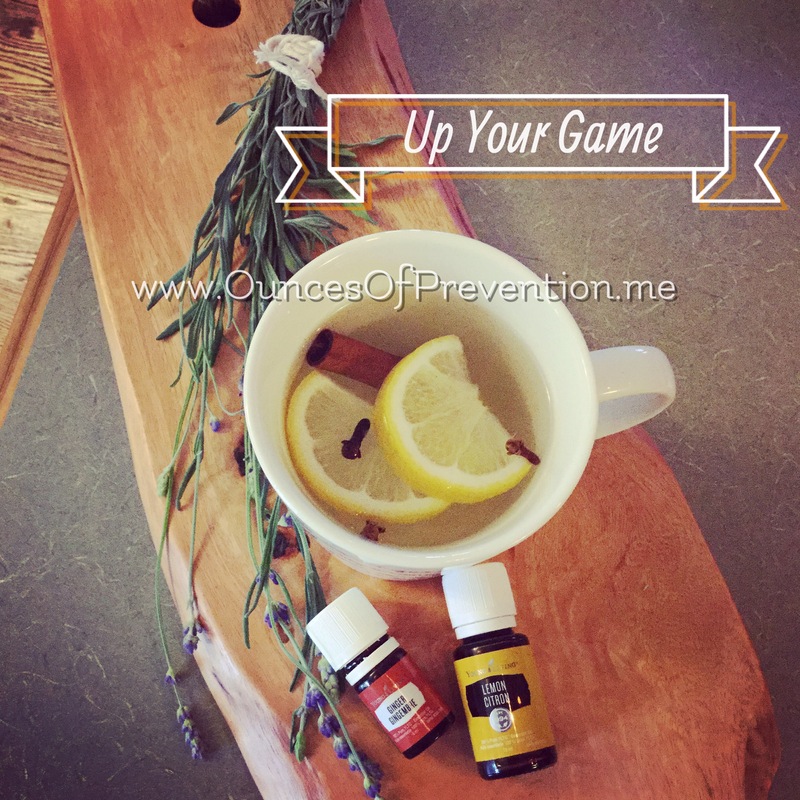 HOW TO: Boil the kettle, and pour hot water into mug over top of sliced lemon, 1 drop pure Young Living Therapeutic Grade lemon essential oil, and 1 drop YLTG cinnamon, or ginger, or cardamom essential oil, and 1 Tablespoon local unpasteurized honey. Add a cinnamon stick and whole cloves or whole green cardamom pods. Use the cinnamon stick or a spoon to ‘squish’ the lemon slices into the bottom of the mug to release the juice from the lemon. √ CAUTION: If serving to children remove cloves and cardamom pods first, and allow to cool down! To order Therapeutic Grade essential oils at 24% discount, produced with utmost purity from Young Living, CLICK HERE. Smoothies are a great way to ensure adequate intake of macro nutrients (protein, good fats, carbohydrates, vitamins and minerals) as well as adding important protective phytonutrients, antioxidants, trace minerals, and even extra fibre to your daily diet! What Makes A Smoothie ‘Smooth’? Use an electric blender, handheld immersion blender, or ‘Magic Bullet’-type blender. Add a piece of banana, or avocado (avocados are a healthy fat source!). Add another healthy fat such as organic coconut oil, cold pressed Flax seed oil, or Hemp seed oil. TIP: Ripe bananas or avocados may be peeled, cut into portion sizes and FROZEN to preserve them for later use. When you remove a wedge of frozen avocado from freezer, drop into a cup of warm water for a couple of minutes to soften up prior to blending. Frozen avocado is very dense and hard on your blender blade unless softened up a bit first. Pure Protein Complete™ or Balance Complete™ or Aminowise™ from Young Living Essential Oils. Or Bulletproof™ Upgraded Whey Protein. A Tablespoon of nut butter (almond, cashew, or 100% pure peanut – if no allergies). Add a handful of Organic Spinach or Kale (stems removed). a Green Foods blend (generally 1 scoop of powder, follow directions) or open 2 Multigreens™ capsules & add to smoothie. TIP: Keep NingXia Red in the refrigerator and add cold to your smoothie. Freeze berries for future use. Or add an ice cube when blending your smoothie. BULK IT UP with soluble/insoluble dietary fibre options! 1 teaspoon ground Flax Seed (Golden organic flaxseed, or brown flaxseed). Tip: Grind whole flax seeds in an electric blade coffee grinder. CHOCOHOLIC? ~ the following additions will satisfy your craving! HORMONAL concerns? Menopause? Memory? Migraines? Add D. Gary Young’s “Longevity” daily essential oil blend to your morning smoothie: Longevity Vitality™ essential oil blend OR a drop each of one or each of the ‘Vitality’ (US) or ‘Plus’ (Canada) oils (certified G.R.A.S. or F.A. by the FDA, and as NHP’s by Health Canada – genuine Young Living Therapeutic Grade Essential Oils: Clove essential oil, and/or Thyme essential oil, Orange essential oil and/or Lemon essential oil, and genuine YLTG Frankincense essential oil. BUSY MORNINGS or ON THE ROAD? TIP: Smoothies may be blended ahead of time and stored in a sealed glass container in the refrigerator or in a cooler, however, it is best to blend and consume your smoothie right away. Nutrient loss is inevitable the longer that delicate ingredients are exposed to oxygen and light. NingXia Red wholesome beverage blend is available in 60 ml Single Serving sealed packets making it a convenient solution for Super-Food on-the-go! AND has more beta carotene than carrots, more vitamin C than oranges, contains 18 amino acids, 21 trace minerals, 6 essential fatty acids, B-vitamins, and vitamin E.
NingXia Wolfberries themselves, offer the highest known protection against the dangerous ‘superoxide free radical’. The ORAC (Oxygen Radical Absorbance Capacity) test, developed by USDA researchers at Tufts University, is one of the most valuable methods for measuring the ability of antioxidants to absorb dis-ease-causing oxygen radicals. The test showed that the Wolfberry has unsurpassed ability to absorb the bad free radicals. NingXia Red™ has the highest levels of Superoxide-ORAC activity among its competitors. NingXia Red® is a delicious drink that contains whole Ningxia wolfberry puree; a super blend of blueberry, aronia, cherry, pomegranate, and plum juices; natural stevia, grape seed, and pure vanilla extracts; and orange, yuzu, lemon, and tangerine essential oils. NingXia Red provides a whole-body nutrient infusion. References: Essential Oils Desk Reference, Sixth Edition. © 2014, Life Science Publishing. The Complete Aromatherapy & Essential Oils Handbook for Everyday Wellness, Nerys Purchon and Lora Cantele. ©2014. Experience The World of Essential Oils Version 2.0, Young Living Essential Oils. Einkorn “original non-hybridized wheat”contains 1.21% gluten, in contrast to 9.92% in today’s ‘whole wheat flour’. Einkorn is the oldest “staff of life” variety of wheat. It’s natural genetic code means compatability with your digestive system and your body. 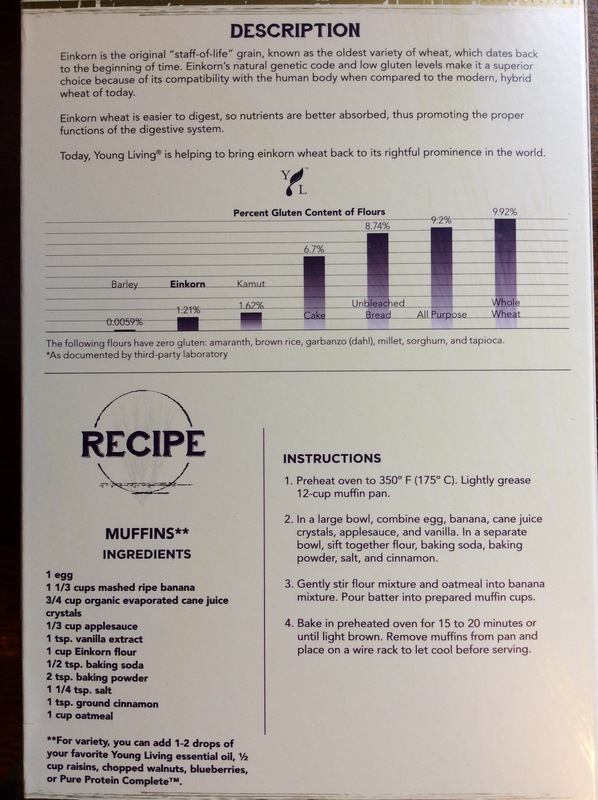 Today Young Living® is bringing einkorn wheat back to its rightful prominence in the world. The einkorn kernels being harvested first made their way into the marketplace in the form of pancake mix and spaghetti. Now the flour has become available. Scientists who have been studying einkorn for years say it is easier to digest, contains vitamins, minerals, and proteins important to our health, and is probably the most preferred grain to eat. Books available: Einkorn: Recipes for Nature’s Original Wheat, by Carla Bartolucci. IMPORTANT: THE INFORMATION WITHIN THIS DOCUMENT WAS OBTAINED FROM REPUTABLE REFERENCED RESOURCES, LECTURES, AND BIOCHEMISTRY EDUCATION WHICH THE AUTHOR HAS RECEIVED OVER THE PAST TWO DECADES. IT IS NOT INTENDED TO PRESCRIBE OR RECOMMEND A PARTICULAR TREATMENT OR PROTOCOL, BUT RATHER, TO EMPOWER THE READER WITH KNOWLEDGE THAT MIGHT HELP THEM TO HELP THEMSELVES TO BETTER HEALTH NATURALLY.